Description: This rebuilt carburetor replaces the original Marvel-Schebler design and fits the following tractor models: 40, 420, and 440. It is being used as a direct replacement for Carburetors with the numbers matching: TSX777, TSX768, and TSX756. There will be an additional core charge of $50 – this is refundable if you send your core to us. ABOUT THIS PAGE: You are viewing the product page for our John Deere 440 carburetor. 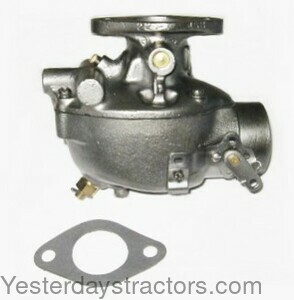 As one of the largest suppliers of new and rebuilt John Deere 440 tractor parts we most likely have the carburetor you need. Use the information above including the carburetor part number and picture (if available) to assist you in making your decision to purchase. If you are looking for a different carburetor, or have trouble locating the John Deere 440 parts you need, we have MANY parts that are not listed on our website so feel free to contact us.